​Well, it finally happened: the future most interesting wrestler in the WWE has announced his retirement, and Tom Brady just lost his most important cog, meaning he'll only go 13-3 in the most impotent division in football next year en route to another title. ​Tough life for those Patriots! The only fun thing about that godforsaken team ​is now gone, but don't worry; Twitter sent him out in style. THIS ISN'T HOW THE ​TB12 METHOD WAS SUPPOSED TO GO? AREN'T YOU STILL PLIABLE ENOUGH, ROBERT?! And yes, most messages were sent in the nicest way we know how. Of course @RobGronkowski is retiring now. 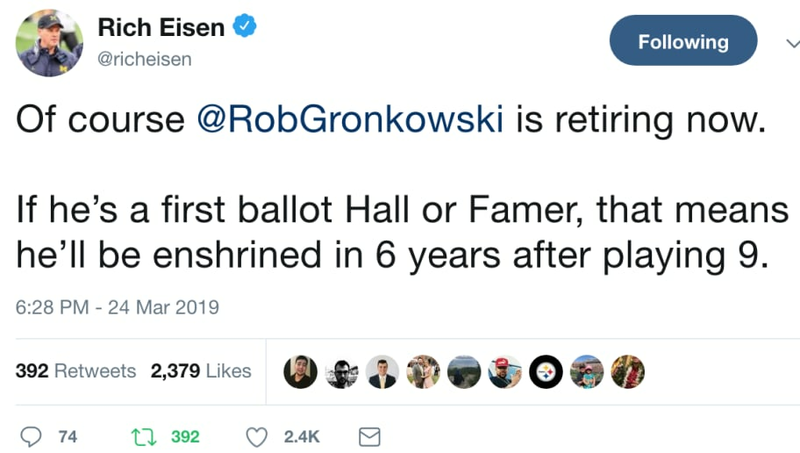 If he’s a first ballot Hall or Famer, that means he’ll be enshrined in 6 years after playing 9. ​​I mean, come on. Could it get more perfect than that? What a career for the #Patriots legend. Against all odds, though, this stat is somehow real. So, what's next for the kid? Today, Gronk announces his retirement. ​​LITERALLY tomorrow. You know this is happening. With Gronk, it's really the stories that will linger, even longer than his on-field exploits. Like this one! First time I met Gronk was at his house in Tampa the night before a blackout party. First words he said to me was “hey man good meeting you come funnel this”. He set the tone on and off the field. ​​Every moment of the day, he's just...perfectly Gronk. ​​Whether he's chugging wine or macking on Tide Pods, he can always be counted on to be the life of the party, even if Bill Belichick has no interest in throwing a party of any kind. ​​He's just Gronk. And we'll never see the likes of him again.